Mastered the entire "Rock Band" series? Achieved global fame touring the world on "Guitar Hero"? If so, perhaps it's time for you to crank the volume and wow those imaginary crowds with your fret-melting chops on ... "Ukulele Hero"! The ukulele is a small Hawaiian guitar-like instrument with four strings that originated in the 19th century. Okay, so Ukulele Hero isn't quite as rock 'n' roll as its guitar-based counterparts. It's also not strictly a game, but rather an interactive virtual instrument application that simulates the strings and frets of a real ukulele. It was created by Duncan Menzies a graduate student on the Media and Arts Technology programme at Queen Mary. Using Duncan's custom-built hardware controller, the player can strum actual chords as though they were playing a genuine acoustic instrument. By connecting the controller to a computer, the software produces both the audio, and an on-screen visualisation of the frets and strings being played. Notes are played by pushing 16 buttons that correspond to the positions behind the frets of each string. The button in the top right corner corresponds to the position behind the first fret of the highest string, and so on. You 'pluck' strings by moving a slider up and down. It is made from a 'potentiometer'; which is just a variable resistor that changes the input voltage as you slide the slider. Former Beatle George Harrison was a ukulele fan and had a big collection of ukes. Ukulele Hero was written using an open source "creative coding" environment called "openFrameworks", which is essentially a set of libraries for the programming language C++. OpenFrameworks is a great toolkit for creating interesting applications quickly, even with little or no programming experience, as it provides an easy way to use powerful libraries of code that other programmers have already written. So if you are into both electronics and music, why not have a go yourself - not at playing Ukulele Hero, but at creating your own digital instrument. 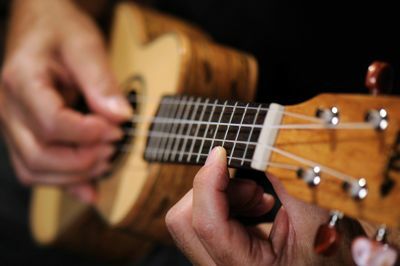 Watch a video demonstration of Ukulele Hero.